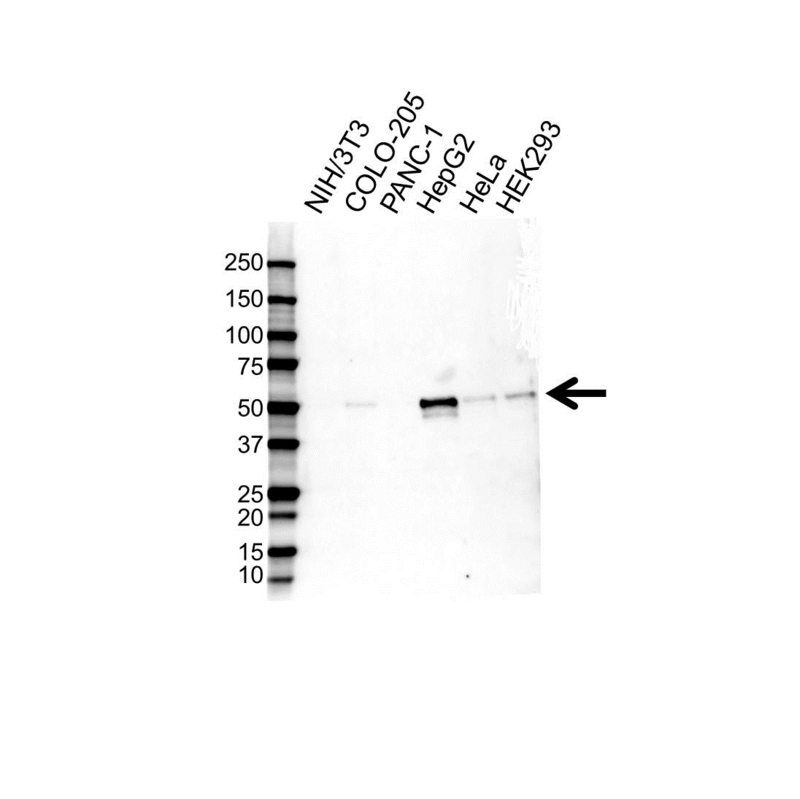 Western blot analysis of whole cell lysates probed with FOXA1 antibody followed by detection with Goat anti Mouse HRP conjugated (1/10,000, STAR207P) and visualized on the ChemiDoc MP with 90 second exposure. Arrow points to FOXA1 (molecular weight 50 kDa). FOXA1 antibody recognizes FOXA1, also known as Hepatocyte nuclear factor 3-alpha, HNF-3-alpha, HNF-3A, TCF-3A or transcription factor 3A. Mouse anti Human FOXA1 antibody recognizes FOXA1, also known as Hepatocyte nuclear factor 3-alpha, HNF-3-alpha, HNF-3A, TCF-3A or transcription factor 3A. FOXA1 encodes a member of the forkhead class of DNA-binding proteins. FOXA1 encodes a member of the forkhead class of DNA-binding proteins. These hepatocyte nuclear factors are transcriptional activators for liver-specific transcripts such as albumin and transthyretin, and they also interact with chromatin. Similar family members in mice have roles in the regulation of metabolism and in the differentiation of the pancreas and liver (provided by RefSeq, Jul 2008). Mouse anti Human FOXA1 antibody detects a band of 50 kDa. The antibody has been extensively validated for western blotting using whole cell lysates.